Good morning from Hamburg and welcome to our Daily FX Report. 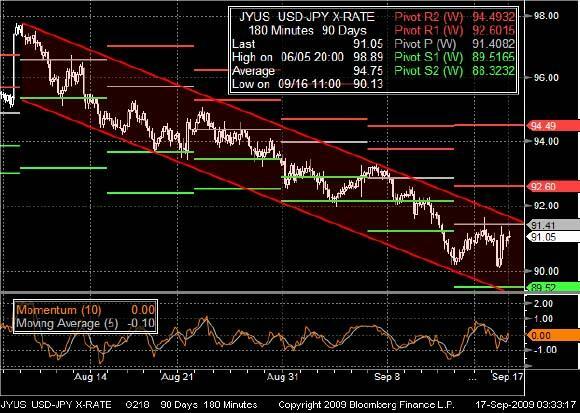 It is very strange what currently taking place at the FOREX market; it seems that the USD and JPY reverse its roles, as more and more carry-trader comes on the USD. However, we wish you a successful trading day. The EUR continued its winning streak versus the USD and climbed pip by pip near to a new year high. Yesterday the EUR/USD touched its highest level at 1.4737 and opened in the early Tokyo trading hours nearly unchanged. The bearish USD market is driven on optimism that the global recession is easing. Economists expect today a U.S. report which may show that U.S. housing starts rose and the manufacturing improved. Also the GBP weakened against the EUR to a fourmonth low as a U.K. report showed that the national unemployment rose to the highest level since 1995. The EUR/GBP climbed yesterday from 0.8891 at its opening to 0.8924 at its closing. The USD/JPY rose after a report showed that Japanese purchases of foreign bonds reached a four-year high. The NZD and AUD benefits by the increasing demand for higher yielding and strengthened both near to its highest level in more than a year versus the USD. The NZD/USD rose 1.29 % while the AUD/USD gained 1.17 %. Besides the strong U.S. economic data the CAD rose against its U.S. counterpart as crude oil prices increased, one of the most important national exports. The USD/CAD declined to 1.0645 at its lowest level on Wednesday. Since August, the currency pair has been trading in a bearish trend-channel and touched its lowest level around the 90.00 at least. An increasing Momentum indicator shows at the moment a short recovering phase but is apparently not strong enough to push the USD over its pivot point. If the currency pair could cross its pivot point, it may have enough power to quit its long-term downward movement. 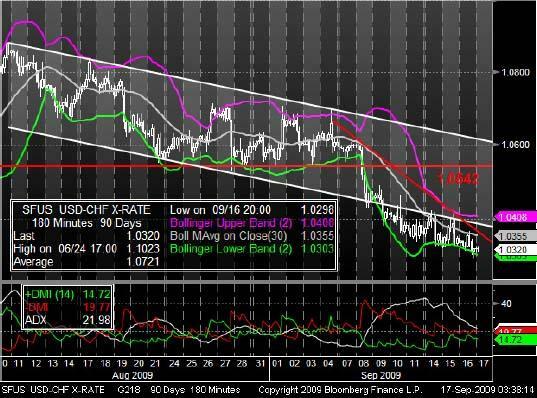 Since the beginning of August, the USD/CHF traded in a downward trendchannel when the bears accelerate the movement and broke through the lower trend-line in September. Previously the Bollinger Bands contracted like a bottleneck and indicated the breakout, similar to the current market situation. Though now, the climbing +DMI could indicate that the pair reached at first a basement.